How Do You Know if You Need a Wisdom Tooth Extraction? Tooth extraction requires professional dental attention to carefully remove a tooth that is causing pain, risks infection, or when an incoming tooth may cause a misaligned or crowded smile. More often than not, patients will ask us if they need a tooth pulled while we track the progression of their wisdom teeth. Not everyone requires tooth removal, and we do our best to preserve the strength and structure of your smile with preventive dental care. But when it’s absolutely necessary to perform tooth extraction in Vienna, our treatment process is gentle and effective. Call us at (703) 288-1800 to schedule your consultation. Sometime after or even during your teenage years, you third molars begin to develop in the back of your mouth. For some people, this causes a painful problem. As you can probably guess, those molars are usually referred to as wisdom teeth. Dr. Priti Naik wants to minimize the pain of these new teeth growing in and may recommend wisdom tooth extraction. Unfortunately, wisdom teeth can crowd your permanent teeth or even prevent the development of new teeth. Around age 11 or so, we look to see how and if a patient will be able to handle their wisdom teeth. Typically, they cannot, and we’ll recommend extraction before ages 17 to 19. This ensures timely removal of problematic teeth before any larger dental issues develop, while protecting the oral health and structure of the teeth. Sometimes your jaw may not be large enough for your wisdom teeth and they may not be able to break through your gums. Crowded teeth can also damage the alignment of your teeth, and even cause jaw irritation, jaw pain, TMJ pain or gum disease. These are all reasons why one should opt to get their wisdom teeth removed! Before your procedure, Dr. Priti Naik will give you an anesthetic to numb the area around your wisdom teeth prior to removal. To make sure there is no additional pain, Dr. Naik may also prescribe pain medication and antibiotics to aid in the healing process. In order to extract the wisdom teeth, Dr. Naik may have to remove a thin layer of gum tissue to expose an impacted tooth. In some cases, an impacted tooth may have to be removed in pieces to allow for safe and effective tooth removal. 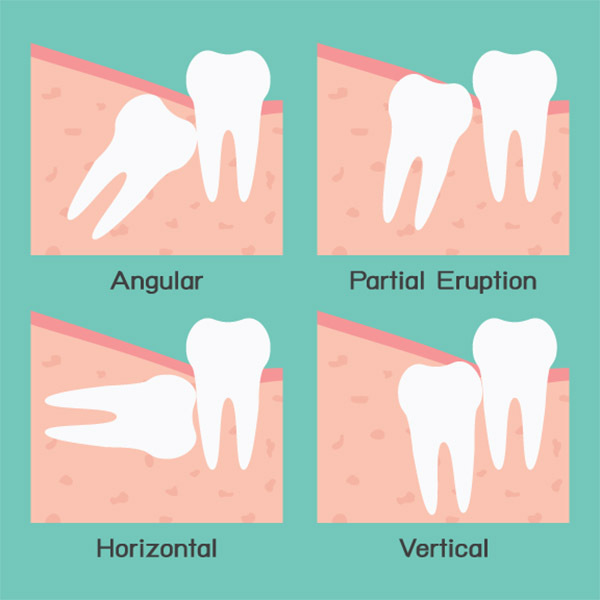 Do Wisdom Tooth Extractions Hurt? Having a wisdom tooth removed is a painless process thanks to modern advances in restorative dentistry. With use of a local anesthetic, the area is effectively numbed before treatment. Some patients report feeling a sensation pressure to the area during tooth removal, if at all. If you are concerned about feeling relaxed at the dentist, Dr. Naik and her team will take the time to guide you through what to expect and listen to your specific concerns to ensure that you feel comfortable and safe before any treatment begins. Once you get your wisdom teeth removed, you might need stitches – but don’t be afraid! After a period of time, your stitches will dissolve. Dr. Naik will prescribe you some painkillers to help alleviate any pain. If bleeding occurs, it is recommended to place a cotton ball over the gum and gently apply pressure. As a team that strives to be your best dentist in Vienna, the staff at Priti Naik DDS will strive to help you even after tooth extraction. We’ll keep you informed about what to expect after tooth extraction, provide post-op care tips to heal quickly and answer any questions you may have. With years of hands-on experience in restorative dentistry, Dr. Naik looks forward to providing the best quality of care for your dental needs.